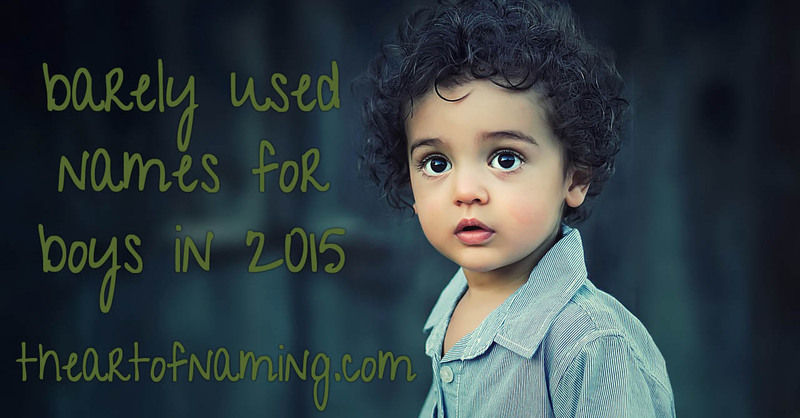 We hear about common and popular names often. 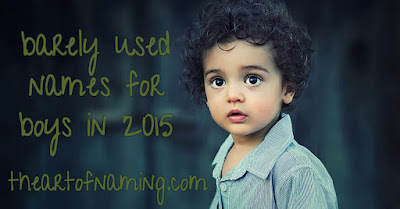 The social security administration's yearly baby name list came out a couple weeks ago for the US in the year 2015. Everybody loves to focus on the #1 names and the top 10. Quickly rising names are noted as ones to watch and quickly falling names get even more parents jumping overboard. What about all of the names that float under the radar? There are still plenty of great names beyond the Top 1000 list. These would be excellent choices for parents who want something more unique rather than something popular. The ones that I've handpicked from 2015's data are all very usable for a modern boy despite being uncommon at the moment. Harris comes from a surname that's derived from Harry, which of course is a diminutive of Henry. Harris has been in use in the US since 1880 on record. It fell off the Top 1000 chart in the 1970s, but it's currently just outside of it and could rejoin again in the next year or five. Which do you like more, Harris, Harrison or Harry? Jericho is the name of a biblical city in Israel, mentioned in the Old Testament. It isn't clear what the name truly means, but it is associated with the Hebrew word yareach which means "moon", or it could possibly be related to the Hebrew word reyach meaning "fragrant". The name has only been in use in the US since 1970 but it's always been outside the Top 1000 except for twice in 2013 and 2014. Teagan comes from an Irish surname. It is the anglicized form of Ó Tadhgáin which indicates a "descendant of Tadhgán." Tadhgán itself comes from the name Tadhg, pronounced TIEG, which means "poet" in Irish. Teagan is used much more often for girls. It ranked at #228 in 2015 on the female side, but for boys it slipped out of the Top 1000 for the first time since 2003. In all, it has only been in American use since 1986. Just as the name suggests, Bridger comes from an English surname which refers to a person who lived near or worked on a bridge. Americans have used this name occasionally since 1974. The few times it has ranked within the Top 1000, it was never higher up than #907 which was its peak in 2013. Will it become the next big occupational surname name for boys? Will it ever rise higher than the bottom of the charts? Keanu (197 births - #1020) This handsome Hawaiian name means "the cool breeze" from the elements ke and anu. It is indeed a cool name, but does its Hollywood star-power make it unusable or does Mr. Reeves give it the right amount of familiarity? It may indeed be because of him that the name has received usage at all because it's only been around on record in the US since 1990, coinciding with the actor's popularity. It ranked in the Top 1000 from 1994-2005, could it rejoin again soon? Foster is an English surname that has several different possible origins. First, it could be a contraction of Forester, referring to a keeper of the forest. Second, Foster may come from an Old French occupational name, forcetier, which is a scissor maker; or perhaps fustrier which is a woodworker. Lastly, it may be derived from the word foster which means to encourage or promote development, and would refer to those who care for children who are not their own. Foster has been in use in the US since 1880, ranking until the early 1960s. It was in the Top 1000 again in 2013-2014 but fell as of 2015. Could it make its way up the chart? It comes from Randel which is a diminutive of Randolf and other similar names that start with rand- which is a Germanic element meaning "rim (of a shield)".This name is admittedly much more dated than the rest. It ranked very well from the early 1950s to the early 1960s, hitting as high as #53 in 1955. It may feel more like a dad/grandpa name right now, but it has always been in use and could work on modern boys still today. However, data indicates it is on its way down since it dropped out of the Top 1000 in 2015 for the first time since 1905. Is it time for this name to fade or does it deserve to stick around? The surname Howard comes from either the German given name Hughard or the Ancient Scandinavian name Haward / Hávarðr. The first is composed of the Germanic elements hug meaning "heart, mind" and hard meaning "brave, hardy". The second has Old Norse elements há meaning "high" and varðr meaning "guardian, defender". So which is it? Well, Howard may also be derived from ewehirde which is a Middle English term for a ewe herder. I'll let you choose your favorite. This name has always been in use but it peaked in 1921 and again in 1947. It has always ranked within the Top 1000 except for the years 2013 and 2015. Do you think it will continue to fall? Garrison is a word that refers to a body of troops stationed within a fortified stronghold in order to protect it. It also refers simply to the city, fortress or ship used by the military base. Garrison comes from the French word garnison, from the verb garnir meaning "to equip". It is also an English surname meaning "son of Garrett". Garrison has been used as a given name in the US since 1912. It didn't rank in the Top 1000 until 1986. The highest it has ranked is #566 in 1999. As of 2015, it's dipped back below the Top 1000. Merrick comes from an English surname which was originally derived from Meurig, the Welsh form of the name Maurice. Now, Maurice comes from the Roman name Mauritius or Maurus which is Latin for "dark skinned". The name Merrick dates back to 1905 in the US for boys. It does have occasional usage for girls since 1981, but it has never ranked within the Top 1000 for either gender. As of 2014 for boys, it was as close as it has ever been with a rank of #1036, but it dropped a bit by 2015. Will it ever crack the list? 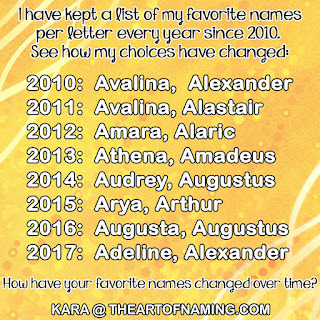 Which of these ten names do you like most? Which do you think could be the first of them to rank on the Top 1000 chart in the coming years? Which names will only decline more?